A printer that uses living cells for ink can print brand-new skin directly onto a living body. Tests done on mice show that rapid healing can be achieved using this method. Researchers from the Wake Forest Institute for Regenerative Medicine (Weixin Zhao, Tamer Aboushwareb, Dennis Dice BS, Anthony Atala, James J Yoo) presented their paper at the American College of Surgeons Clinical Congress held earlier this month. 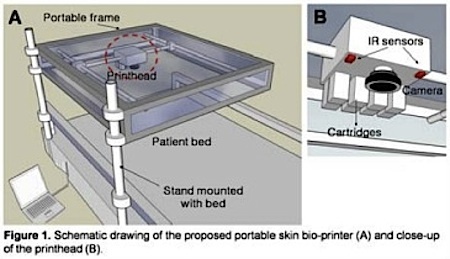 The printer has two heads, one of which ejects skin cells mixed with fibrinogen (a blood coagulant) and type I collagen (the main component of the connective tissue in scars). The other head ejects thrombin (another coagulant). Like the components of quick-setting resins which must be kept separate until mixing causes a chemical reaction that hardens the resin, the products of the two print heads mix to immediately form fibrin, yet a third protein involved in the clotting of blood. The whole confection is topped by a layer of keratinocytes (i.e. skin cells), which are also printed. This bioprinter reminds me of what appears to be a similar device from the movie Starship Troopers, which is loosely based on the Robert Heinlein novel of the same name. From Clinical Congress notes via Next Big Future.